Werner Heisenberg (1901 – 1976) was a German physicist who studied physics and mathematics in Munich. He studied under Arnold Sommerfeld alongside Wolfgang Pauli, but it was when he first met Niels Bohr that his interest in quantum physics and his career took off. In 1926 he was working on a way to explain the relative intensities of the emission and absorption lines of hydrogen when he stumbled onto an idea which was to have far greater importance. He chose to represent the frequencies and intensities of the various absorption and emission lines as a table of values. It was while trying to manipulate this table that he discovered that the normal rules of multiplication did not seem to apply. What Heisenberg has unwittingly discovered was matrix manipulation. Matrix manipulation is now commonplace in mathematics and was known in mathematical circles in the 1920’s, but Heisenberg was a physicist and not a mathematician, so he struggled for some time to come to terms with his discovery. Multiplication of matrices is not commutative, that is [A][B]≠[B][A], the result of multiplying two matrices together is different depending upon the order in which the multiplication is written. Where [I] is known as the identity matrix and is the equivalent of unity in matrix multiplication, so ħ[I] is the equivalent of a constant in matrix multiplication. Heisenberg realized that the non-commutative nature of this matrix multiplication implied that it was not possible to know both the position and the momentum (velocity) of a particle to an arbitrary degree of accuracy. There was an uncertainty inherent in the system which was related through the constant term to Planck’s constant, which appears in the right hand side of the equation. In effect there is a tradeoff between the accuracy with which position and the accuracy with which velocity can be known. This subsequently became known as the Heisenberg Uncertainty Principle. Heisenberg at first came up with a heuristic explanation of why this should be the case. This involved looking at the way in which things are measured. In order to determine the momentum of a small particle such as an electron it is necessary to measure both its mass and its velocity. All electrons have the same rest mass, so to measure the momentum it is sufficient to measure just the velocity (at least under non relativistic conditions). Velocity can be determined by measuring position at two points separated by a small interval of time. On the scale of the electron however, the only tools available to measure the position are other sub atomic particles such as other electrons or photons, which are of comparable size and have comparable energies to the electron being measured and it is this that leads to the uncertainty trade-off. The situation can be likened to that of trying to measure both the position and velocity of a ping pong ball when the only tools available to make the measurements are other ping pong balls. By firing a stream of ping pong balls at the subject ping pong ball eventually one will hit. The position of the subject ping pong ball can then be determined by detecting the fact that one of the incident balls scored a hit and deviated from its trajectory. Unfortunately the very fact that there was such a collision means that the velocity of the subject ping pong ball has changed. Furthermore the extent of such a change is indeterminate and so it is now impossible to perform a meaningful second measurement in order to discover the velocity of the subject ping pong ball. The position of an electron can be measured by bombarding it with photons. The accuracy of such a measurement is proportional to the wavelength of the incident light. The lower the energy of the incident light, the less the disturbance when it interacts with the subject electron, but at the same time the accuracy of the measurement is reduced. Using light of a longer wavelength and hence a lower frequency means less accuracy when measuring position. Using light of a shorter wavelength and higher frequency while it improves the accuracy of the measurement of position has a secondary effect in that it presents more of a disturbance to the electron which is the subject of the measurement, making the measurement of the electron’s velocity less accurate. 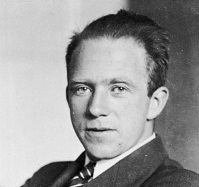 Werner Heisenberg developed the uncertainty principle as a result of considerations of the mechanics of atoms using matrix methods in what came to be known as Matrix Mechanics. Meanwhile Erwin Schrödinger developed what turned out to be an equivalent idea based on the use of his wave equations. Later Paul Dirac showed that Heisenberg’s and Schrödinger’s ideas were in fact equivalent to one another. Niels Bohr had developed a model for the hydrogen atom in 1916 by matching the centrifugal force against the electrostatic force acting between the hydrogen nucleus and the orbiting electron. Bohr needed a second equation in order to solve for both orbital radius (position) and orbital velocity. He chose to adopt an assumption first put forward by John Nicholson, that angular momentum was quantised and could only take on values which were an integer multiple of Planck’s constant. The problem with Bohr’s model is that it threw up a strange anomaly: In Bohr’s model the orbital radius increases as the square of the energy level and the electron has to move from one orbit to another without ever occupying any point in between, the so called “Quantum Leap”. The French physicist de Broglie then went on to suggest that the electron was not in fact a particle, but could instead be regarded as a wave. He proposed that the wavelength of such a wave was equal to Planck’s constant divided by the linear momentum of the electron. (Although quite why wavelength should be identified with Planck’s constant in this way, when at all other scales it is identified with the total angular momentum divided by linear momentum, is a mystery). This led to the idea that for each energy level there is a whole number of such waves associated with one orbit of the electron. Closer examination however shows that de Broglie’s waves are just a restatement of Nicolson’s assumption, but couched in terms of frequency rather that position. Heisenberg’s uncertainty provided Bohr with a way off the hook. Bohr argued that uncertainty was not a phenomenon associated with measurement at all. Instead he suggested that uncertainty was somehow intrinsic to the particle. Bohr argued that the particle did not need to move from one orbit to the other without occupying any point in between because it was not in one state or the other until it was measured or observed in some way. The electron was in a sort of limbo until an observer tried to measure its energy and it was only at this point that it “collapsed” to occupy one or other position. In effect what Bohr is arguing is that statistical properties, which are normally associated with populations of objects, on the scale of the atom can be associated with a single object or particle. There is no physical model to describe such a particle. It cannot be described in conventional terms but rather only in terms of its properties. This led Heisenberg to comment “The problems of language here are really serious. We wish to speak in some way about the structure of atoms. But we cannot speak about atoms in ordinary language”. Schrödinger tried to summarise this view of the indeterminate nature of particles by analogy. His eponymous cat was a cynical attempt to ridicule the idea, to which he was initially opposed and about which he remained deeply sceptical throughout the rest of his life, but nevertheless this has come to be accepted as an accurate metaphor for what actually happens at the level of the subatomic particle. Schrödinger’s cat analogy is an attempt to express Bohr’s ideas about intrinsic uncertainty on a more human scale. The cat is placed in a sealed box. Also in the box is a device which is triggered by an atomic process such as atomic decay, which is itself subject to uncertainty, to either release or not release a vial of poisonous gas. If during the period of observation the particle decays, this releases the poisonous gas, killing the cat. If on the other hand the particle does not decay, the gas is not released and the cat survives. The probability of the particle decaying during the period of the experiment is 50%. When the experiment is over and the box is opened, the cat is found to be either alive or dead. In the world of intrinsic uncertainty, it is only at this time that the life history of the cat comes into existence. Until then the cat existed in a sort of limbo, that during the period of the experiment the cat is neither alive nor dead, and at the same time it is both alive and dead. Schrödinger had originally proposed his thought experiment (no cats were harmed in the making of this theory) as a way to undermine Bohr’s ideas. Bohr however suggested that this is exactly what happens and eventually persuaded Heisenberg to his line of thought. Schrödinger remained sceptical and Einstein firmly disagreed. He thought that particles had to have deterministic position and velocity, in effect that at any point in time Schrödinger’s cat was either alive or it was dead, and that it was simply a matter that we are not in a position to observe which state it is in until the experiment is over. Bohr’s ideas form the basis of modern quantum theory. In quantum theory particles do not have deterministic position or velocity. It is argued that “uncertainty”, first described by Heisenberg, is an intrinsic property of the particle and that neither position nor velocity exists in any deterministic sense until the particle is subject to some form of observation. The particle occupies a sort of indeterminate state, somewhere between a wave and a particle and literally neither here nor there, until it interacts in some way with its environment. The particle then collapses to take on either the properties of a particle or those of a wave, depending on what type of characteristic the observer is looking for. This idea of intrinsic uncertainty lies at the heart of quantum theory and of the so called Standard Model of the universe. The idea can trace its origins directly back to John Nicholson’s assumption that angular momentum is quantized. It is this idea which leads in turn to the idea of the quantum leap, to the idea of the particle as a wave and to the probabilistic nature of the wave/particle, and yet this assumption does not really bear close scrutiny. The only real substantive reason for believing this assumption to be correct is that it returns the correct values for the energy levels of the atom. On the other hand it ignores the effects of relativity and it is inconsistent with conventional ideas about reality, forcing us to adopt the Bohr view of the universe. There is a model for the structure of the hydrogen atom which is consistent with an objectively real universe in which uncertainty is not regarded as being intrinsic. The model is consistent with Heisenberg’s original description of the nature of uncertainty as a phenomenon associated with the practical issues of measurement – the Observer Effect. The model is described in the accompanying article at https://quantum-reality.net/sampling-the-hydrogen-atom/. ← Particles that wave or waves that particle?